The 8th annual Docklands Business Awards, celebrating the wide-ranging achievements of businesses throughout the Docklands district, took place November 22nd 2018. Smart Dublin were proud to sponsor “The Smart Docklands Award” as part of the event. The awards acknowledged the accomplishments of Docklands businesses in industries as diverse as Fintech, Community Development and Tourism. The Smart Docklands Award, sponsored by Smart Dublin, celebrates outstanding achievements in the application of smart technology. 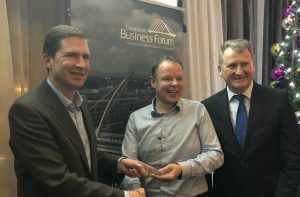 A much deserved winner, Civic Group, was awarded for their exceptional work in delivering the pilot of the first ever autonomous vehicle in Ireland earlier this year.